A Senate committee has thrown cold water on the Trump administration’s controversial plan to transfer the nation’s air traffic control system from the Federal Aviation Administration to a private non-profit organization. The Senate Commerce, Science and Transportation Committee voted unanimously just before the July 4 recess to advance the 2017 Federal Aviation Administration Reauthorization Act (S.1405), which makes only minor tweaks to how the agency conducts air traffic control operations. 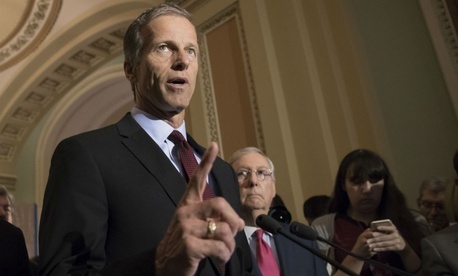 Committee Chairman John Thune, R-S.D., said he left the privatization plan out of his bill in the spirit of the panel making a bipartisan decision on the agency’s future. House Republicans and the White House have argued that privatizing the ATC system will speed up efforts to modernize its infrastructure, including the effort to upgrade from radar-based tracking systems to the NextGen system of tracking aircraft via GPS. The Senate bill requires FAA to assess its current NextGen implementation status and set up annual performance goals, as well as report to Congress on other infrastructure initiatives. It also would better define which FAA employees are considered “essential” and allow FAA to transfer money within the agency in the event of furloughs. Sen. Bill Nelson, D-Fla., the committee’s ranking Democrat, thanked Thune for the inclusive drafting and amendment process, and he stressed that privatizing the air traffic control system would be a nonstarter for many Democrats. The Senate committee’s action brings into question whether Congress will deliver on a heavily touted White House initiative. President Trump in June held a signing ceremony for the principles he wished to see in an FAA reauthorization bill, chiefly ATC privatization. Earlier last month, the House Transportation and Infrastructure Committee included the White House’s plan in its own FAA reauthorization legislation, which advanced on a mostly party-line vote. Under the proposal, the new nonprofit corporation would be governed by a board of directors made up of representatives from airlines, employee unions, and general aviation and airport trade groups. The nation’s 30,000 air traffic control employees would shift to the new nonprofit entity, and their existing collective bargaining agreements would be honored. The organization would establish a user fee on passengers on a per-plane basis, replacing the existing taxes that fund ATC functions within FAA. Ahead of the House hearing, the National Air Traffic Controllers Association announced its formal support for the plan, citing how the bill preserves workers’ collective bargaining agreement and the fact that it would remove air traffic controllers from the uncertainty of the federal appropriations process.